Slender, tapering, stone towers dot the Irish countryside from the northern county of Antrim to Ireland’s most southern county of Cork. 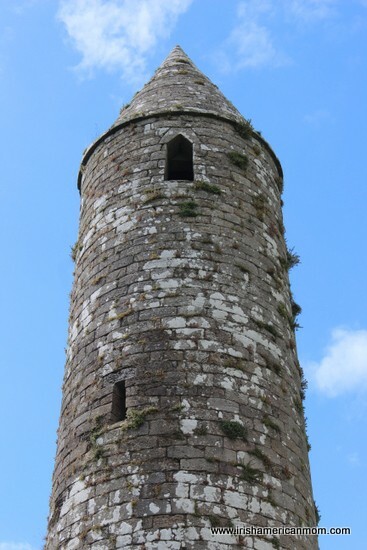 The harp and the shamrock are obvious choices for the honorary title of “symbol of Ireland”, but today I once again wish to elevate another emblem to this distinguished title – the magnificent Irish Round Tower. 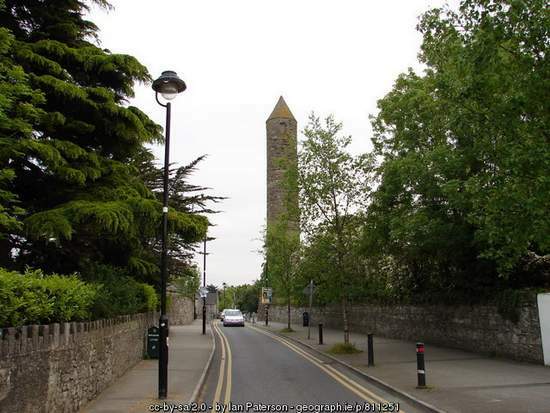 After reading this blog post I hope you too will consider the round tower a true symbol of Ireland. For me, round towers are symbols of endurance, pointing towards heaven as testament to our resilience as a people. These towers have stood for many hundreds of years. A few are over a thousand years old. Imagine that. One thousand years standing unchanged, without succumbing to the forces of nature or man. I can thankfully say I have never seen a round tower defaced by graffiti. Perhaps there is a spiritual aura around these ancient buildings deterring would-be artists from defacing these magnificent structures. 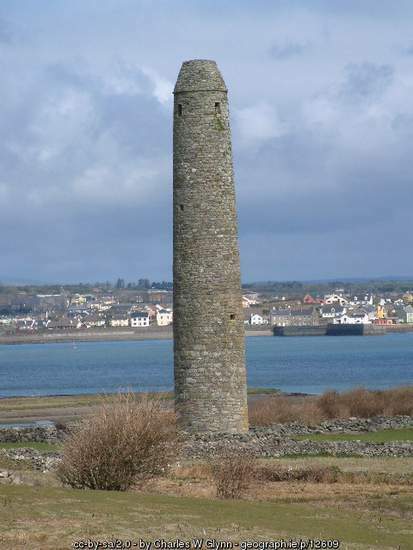 And boy am I glad Ireland’s round towers have stood the test of time, surviving for us to appreciate to this very day. How Many Round Towers Have Survived? 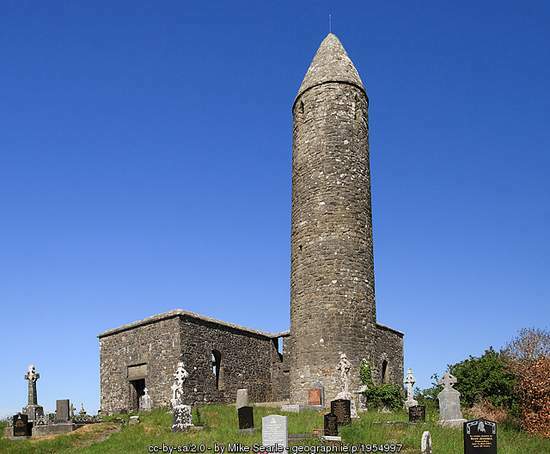 There are 65 towers around Ireland in various degrees of survival, 13 of which are still standing intact with conical roof tops in place. Some are merely stone stumps, reminders of their previous glory. Towers are known to have stood on twenty-five other sites. The survival of so many Irish round towers for over one thousand years is without doubt related to the diligent stone workers who first created them. 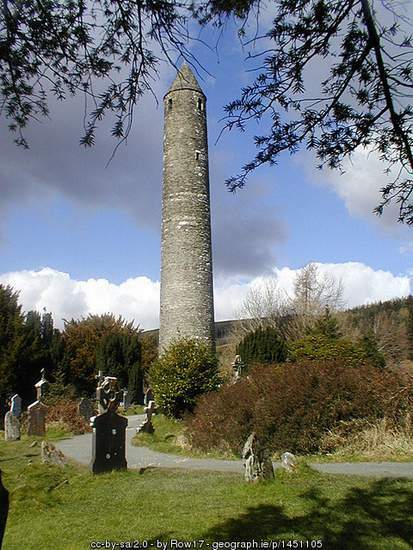 Ireland’s round towers stand as a tribute to the monks who built them. 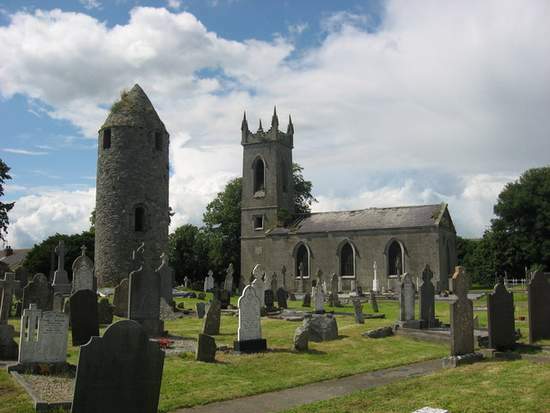 Round Tower and Church at Dromiskin, Co. Louth – © Copyright Kieran Campbell and licensed for reuse under Creative Commons License. Why Were Round Towers Built? When I was a school girl in Dublin I listened to stories of marauding Vikings harassing and terrorizing holy Irish monks. In our stories these ever-so holy Irishmen used their cunning to evade these Nordic trouble makers by stealing away to the safety of their stone towers. I felt such pride on hearing how monks carefully climbed a precarious rope ladder to the tower door high above the ground, clambering to stow their treasures within the tower, and evade these terrifying invaders. Retrieving their ladders and closing the high door, the monks simply waited for the Vikings to lose patience and return to their boats. I believed every word of these enthralling tales. You can imagine my disappointment when I discovered historians today are questioning this age-old tale of stowaway monks to explain the purpose of these towers, and their high, inaccessible doors. But if the towers were not holy hiding spots, then the obvious question is why on earth were the doors usually built at least 10 feet above ground level??? Apparently the answer lies in the engineering or architectural structure of the tower. By placing the door so high above ground level the need to dig a deep foundation was eliminated. The centuries have only proved these towers were soundly designed. 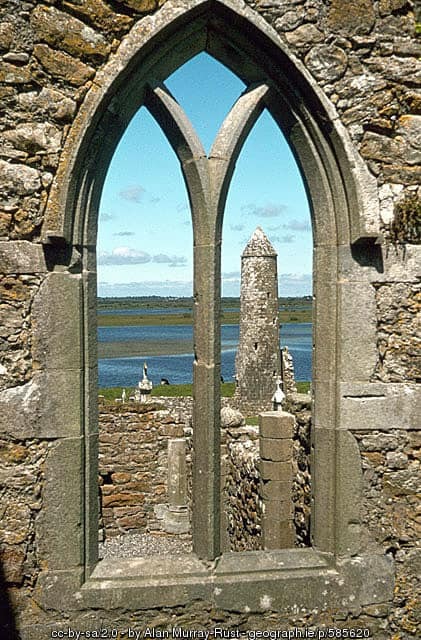 Another feature of note is that the door of every round tower always pointed to the most prominent or important building in every monastic complex. As I researched this post on the internet I came across a very interesting article on the Sacred Sites website. Apparently an American scientist, Philip Callahan proposes these towers were built to store and transmit electromagnetic energy from the earth and skies. Callahan believes these tall stone structures were like man-made antennae. The monks built them to absorb subtle magnetic radiation from the sun which assisted them while meditating in the tower. 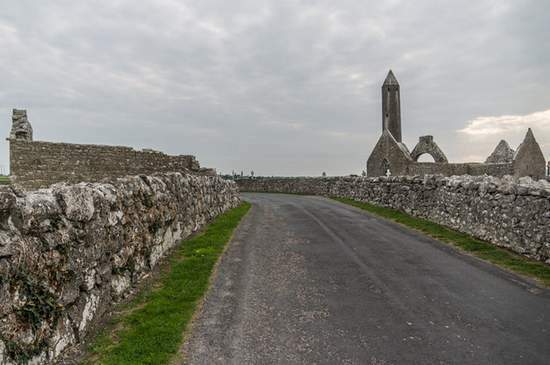 In addition Callahan explores the location of these towers throughout the Irish countryside and even believes their geographical arrangement is far from random. Their locations actually mirror the positions of the stars in the northern sky during the winter solstice. 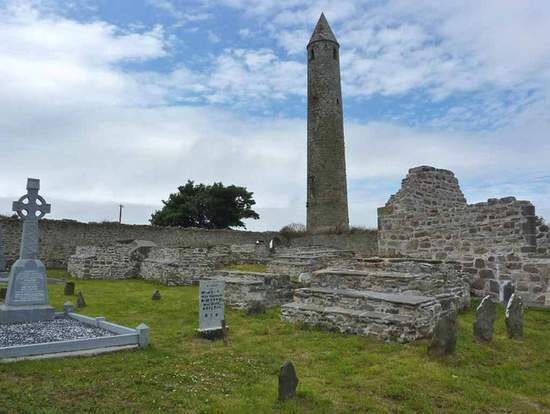 Archaeological excavations have revealed some towers were constructed on ancient sites which were considered sacred places long before the arrival of Christianity to Ireland. Wow! This research just tore to shreds my childhood belief in marauding Vikings and cunning, hiding monks. But at least we can accept these round towers were truly bell towers and were probably used as lookouts for approaching raiders, even the non-Viking kind. Their Irish name is cloigtheach which literally means bell house. And less face it, the Vikings no doubt would have been experts at burning tower doors to smoke the monks out of hiding. But whatever the true purpose of these towers may have been, there is one unquestionable fact. 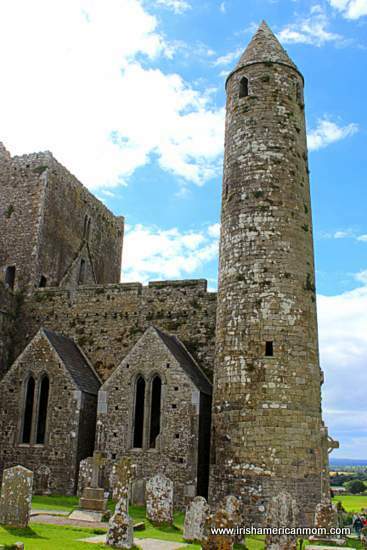 All of these towers were in magnificent settings, surrounded by the beauty of Ireland. Some are now even part of Dublin’s suburbs. Even in the city, our links to our ancient past endure. Truly beautiful pictures of the majestic round towers. Every time I look at one I can’ t help but think of the skill and difficulty it took to build the towers. such skill is lost today unfortunately but we still have the towers!!! Thanks for sharing. 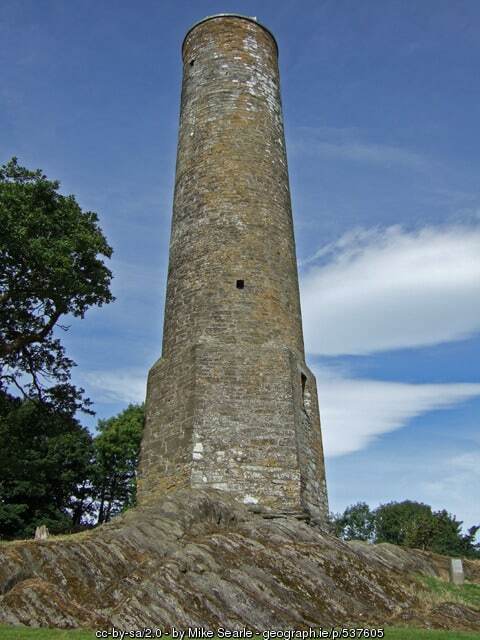 Hi John – It’s incredible how so many round towers have survived the centuries and the onslaught of the elements of the Irish countryside. Every time I see one, I pause in admiration. The skill of these medieval stone masons was simply astounding. When I read your post and saw the marvelous pictures, I thought of the line of verse from Tennyson’s “The Lady of Shalott”: “Four gray walls and four gray towers overlook a space of flowers/and the silent isle embowers the Lady of Shalott.” One could say these towers might have been (are) to the Irish what the minarets are to the Muslim countries. A tribute, too, to the amazing stone masonry, the craft and skill, that these early architects and engineers of stone that so many of these graceful towers remain intact today. 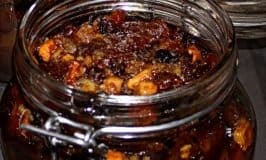 Another wonderful post, Mairead. Thanks for sharing. Hi T.M. – I love how you can always find a wonderful literary link for my posts. Irish school children in the 1970’s always learned round towers were a place of refuge from marauding Norsemen. The image of hiding monks clutching their treasures always sparked my imagination. I had never before heard about the post script to The Lord’s Prayer, but I can fully understand why it was adopted in the days of Viking raids. 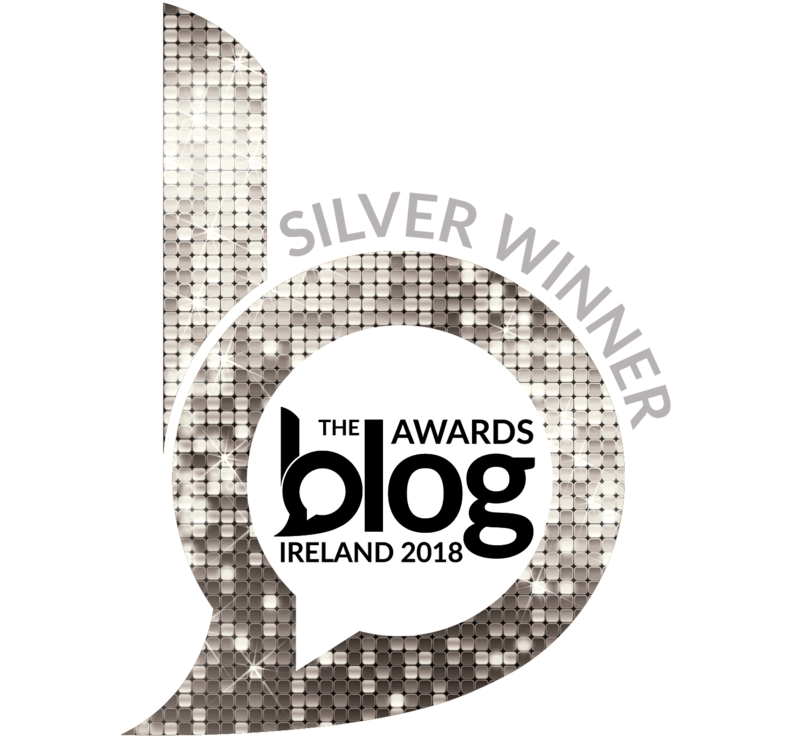 Thanks again for checking out my Irish ramblings. Loved the post this week. They are my favorites also. Such symbols. I believe what we were told in school, that the towers were places of refuge and safety for the monks and sacred vessels, which where all gold. Vikings loved gold! The doors were twelve feet above ground and rope ladders were used to access them. Of course, they were like chimneys, and would have been easy to burn or smoke if the doors had been on ground level, although I have not heard of signs of fire in them. Great lookout points too, as you said. There is a tangible sense of holiness in these places of prayer, for me at least. Stillness, calmness, birdsong, surrounded by beauty. Silent sentinels to our history. Hi Maureen – Like you I will stick to my belief in round towers as refuges from Viking raiders, no matter what scientists and researchers may propose nowadays. The calm and spiritual stillness surrounding these amazing structures needs to be experienced to fully understand it. Thanks so much for checking out this week’s ramble down memory lane. 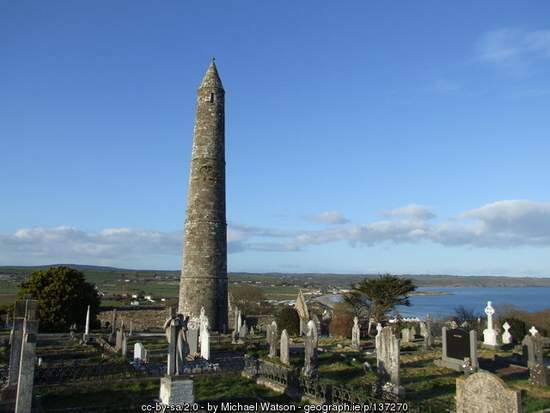 Mairead, I didn’t realize Ireland has these round towers — and so old! So amazing that some have them survived for 1,000 years. Here in America, everything is relatively new, and I’ve often wished I could visit places in Europe to get a taste of that ancient history. So awe-inspiring! 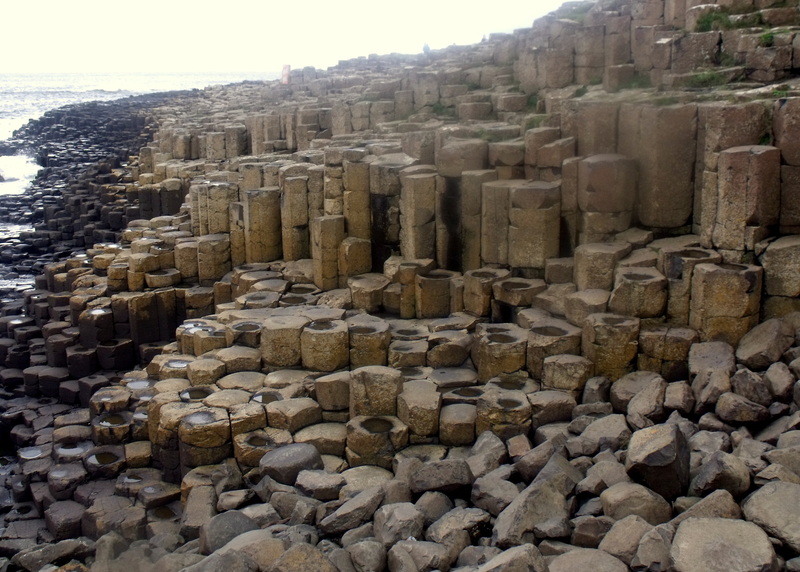 Hi Cheryl – So many structures are very, very old in Ireland. There we co-exist with history, with an innate respect for ancient stones, buildings and land marks. When I first came to America I was astonished at how new everything is, and how buildings over 100 years are considered old. For an Irish woman “old” usually starts at the thousand year mark. 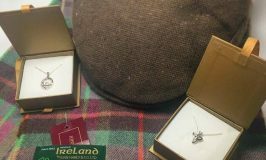 However, when I visited Mesa Verde and experience their ancient pueblo villages I felt a deep-seated connection with the past, just like I do in Ireland when visiting a historical site. Mesa Verde is amazing – loved my trip there many years ago. 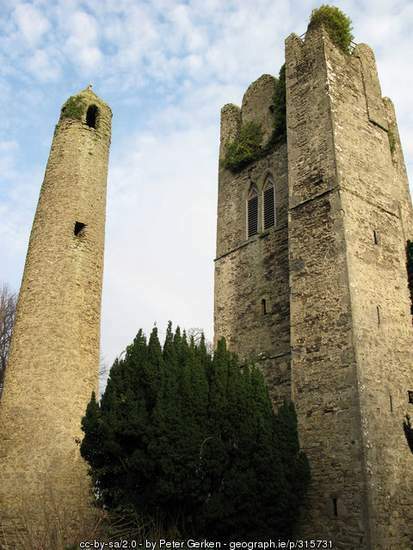 Near tall towers where falcons build their nests” -as iconic a symbol of Ireland as one can find. I suppose if your fine photos weren’t enough one could always look on the bottom of their Belleek pottery and see the round tower that makes up the Belleek mark. As to the debunking the monks, would that be demonking?, researchers theorize or guess but do not know. I prefer the stories handed down and the monks avoiding the Viking hoard or Roman raiders or Gauls, and preserving the western civilization as in the book “how the Irish saved civilization. Besides where is the romanticizing of magnetic resonating towers? Hi Brian – Magnetic resonating towers just don’t capture the imagination like a hatchet-wielding wild Viking does. And into the bargain I read somewhere that Vikings probably didn’t have horns attached to their helmets – now what’s the world coming to, when all the legendary imagery of my childhood is being debunked and thrown out the window. I don’t care what the scientists say, like you, I’m sticking to the romantic and sometimes terrifying stories I learned when I was growing up. Our ancestors had a much deeper understanding of our planet do. My own research into an Irish Round Tower here in Scotland reveals one of its most important secrets. 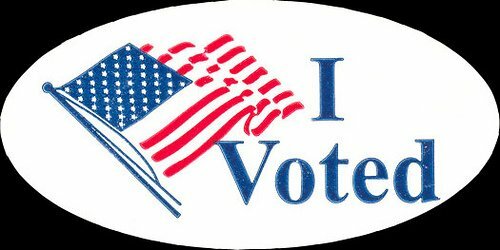 Vey strange, but I am sure others will follow in my footsteps to verify it. Hi David – Thanks so much for the link and for sharing your research.